A selection of hymns and song suggestions based on themes from the Roman Catholic lectionary for the forth Sunday of Lent, Year C.
Most are free-to-use (ie public domain or copyright-free), meaning the words can be copied and sung to at least one tune with no concerns about copyright or performance licensing. Many such hymns are raditional - but where possible a variety of styles / genres are included. 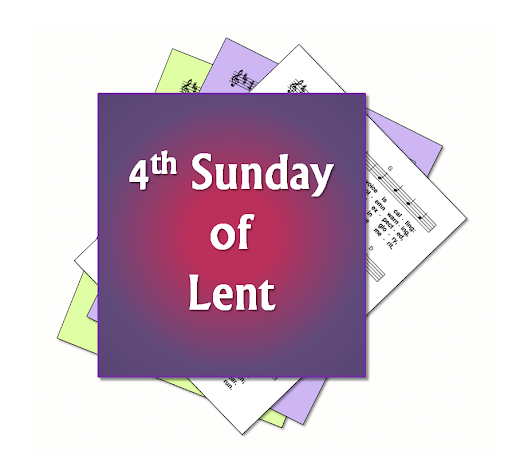 The fourth Sunday in Lent is commonly known as Laetare Sunday. The word "laetare" means rejoice in Latin, and this idea is taken from the entrance-antiphon for the Mass, which starts "Rejoice, O Jerusalem...". Falling roughly at the half-way point in the Lenten season, this is a Sunday when traditional Lenten austerity is relaxed, and we have a reminder of the joyous resurrection to come. The day's liturgical colour is rose, instead of the usual purple of the Lenten season. The Year A readings may be used today, especially if a pre-baptismal / RCIA scrutiny is being held. This is also Mother's Day in some countries. First: Joshua 5: 9-12 - The Isralites kept the Passover when they entered the Promised Land. Psalm: Psalm 33 - Taste and see that the Lord is good / I will bless the Lord at all times / Glorify the Lord with me / Look towards him and be radiant. Second: II Corinthians 5: 17-21 - For anyone in Christ, there is a new creation ... God through Christ reconciled the world to himself. Gospel: Luke 15: 1-3, 11-32 - Parable of the prodigal son.